According to the Tiny Green Thought Bubble Assam tea production has dropped because of a drought caused by global warming. In India, Assam tea, with it’s unique flavor, is not only the country’s most popular drink, it’s a staple of both the domestic and international market. However, global warming and the global drought are starting to wreak havoc on the industry and those who make their living from it (not to mention those who simply love the tea). Time magazine is the latest to support the doublethink theory that the climate models that have been predicting warmer winters are now predicting colder winters, remembering of course that this is all the "settled science" of the global warming industry. The warming lobby is becoming desperate as the snow keeps piling up and Warmist credibility is nose-diving in reverse proportion. Tiny Green Intellects. It Begins - Antarctica is Melting. The Tiny Green Bubble has come up with the astounding news that the Antarctic peninsula is warming at the rate of 11 Degrees C annually! It will obviously be boiling in ten years! A typical alarmist rant about the "melting Antarctica" concentrates on the relatively tiny peninsula which is out of step with the Antarctic continent as a whole. Another bungled green scheme of the Gillard Government has been scrapped with the Green Start project given the axe with $30 million in compensation to be paid out. Huffington Post takes the puerility prize with a Dear Abby format where a "reader" writes in about how to explain huge snowfalls to the "idiots "who don't understand it is all caused by global warming. The letter is answered by the Goebbelesque Institute of Concerned Scientists . So says the Moonbat article in the Guardian as it quotes Warmist "scientists" casting about for something to salvage their faulty theories from the assault of the snow and ice. It could be this and it could be that or it might be something else- all avoiding the obvious which is the whole climate change catastrophe scenario is a load of codswollop ! The Irish Times reports that the current harsh winter may "paradoxically" be the result of Global Warming. This of course follows the new theory that cold is caused by warming and therefore by CO2 . The old theory that CO2 causes warming is still true and if you can understand all this you are probably barking mad. Maybe this is all an Irish joke! Australia's summer is looking decidedly cool in the "hottest year ever" . The NOAA satellite image for down under is almost completely blue with the dark blue sections representing 15 degrees C below normal. 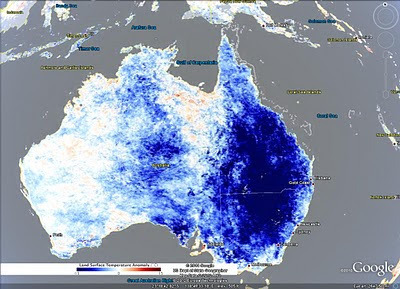 With much of Australia sodden with record rainfall and now a very cool summer, Australia is not looking like the Global Warming wasteland predicted by the alarmists. Have you ever noticed that spew has become the word of choice for vocabulary-challenged alarmists world wide with all the connotations that go along with it.. We no longer emit CO2 we spew it into the atmosphere - we don't have an oil leak , we have oil spewing, we don't generate methane, we spew it from wherever it comes!
. How much carbon does a forest fire spew into the atmosphere? If that happens, the seas will hasten global warming as they spew CO2 back out into the air. And when I think of the money the Government is spewing on the Global Warming Scam it really makes me want to spew. Surprise !Surprise! Labor says that following the dazzling success at Cancun we are all going to get the carbon tax we we promised we were not going to have before the election. The graph below courtesy Steve Goddard displays all four global temperature graphs showing the inaccuracy of the measurements being used to destroy Western economies. 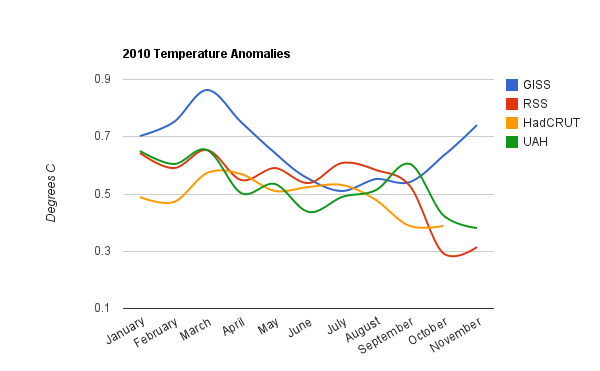 The NASA GISS graph is obviously an outlier but that is the one being used to claim" the world's hottest year".The November anomaly for GISS is twice that of the other three - the "climate scientists " of the world remain strangely mute when crazy graphs like these are published . Alarm bells should be ringing all over the place. Three out of the four metrics show temperatures diving from September - not the picture of out-of-control warming we are being warned about.How can the science be settled when the measurement basis for it is as flaky as this. Hadcrut and GISS using similar techniques have a divergence up to 40%. Hansen must be desperate to post GISS figures this bad ,but maybe it was just for Cancun and will be adjusted later. A cold snap under way this month in Britain and elsewhere in northern Europe was unusual, but it will do little to alter global average temperatures for the year, said James Hansen, director of NASA’s Goddard Institute for Space Studies. One thing is for sure - GISS is definitely man-made global warming . Wackyleaks picture of Sierra Club members in tropical Cancun assuming the position when informed of the record snow and cold sweeping Europe. Congratulations to John Droz Jr at Master Resource who has done a great job explaining the problems with wind power using avatars. It is the kind of educational tool required to explain why "it's clean and it's free" is not correct and deserves to go viral in the blogosphere. UK Solar Installation - Carbon Costs at 600 Pounds/ton! Treehugger reports that Glastonbury Festival Founder Michael Eavis has installed 1100 Solar panels on a cowshed - says he expects to make 60 thousand pounds a year and save 100 tons of carbon emission . Of course the 60,000 quid will be ripped off pensioners and other consumers who don't have solar panels - they are just the collateral damage in the Warmist's war on society as we know it. As well as this with the current carbon price at about 7 pounds/ton a figure of 600 does seem a tad on the high side . Bloomberg reports that Japanese adviser Nishimura suggests over ten years selling carbon allowances to emitters and that "the huge chunk of new wealth" generated be distributed to poor nations for global warming "and other needs" . Mutsuyoshi Nishimura, who was Japan’s chief climate-protection negotiator during the five years through 2008, proposed a $6.3 trillion carbon market to kick- start stalled talks. A small memo to the Mr Nishimura - imposing a costly tax is not generating wealth - it is an impost on companies and organisations that do create it. You actually generate wealth by reducing taxation !The thing that really worries me is that so many dumb politicians might agree with him given the spread of the equally dumb warming alarmism. The Guardian Environment Editor John Vidal has done two very silly things - neither of which will enhance his reputation. The first was to enter a contest with the razor sharp mind of Lord Monckton who has seen off much more competent and credentialed adversaries and secondly after getting a hiding , to publish the one-sided debate in a national newspaper of which at the moment ,he is an editor. Listen for yourself! 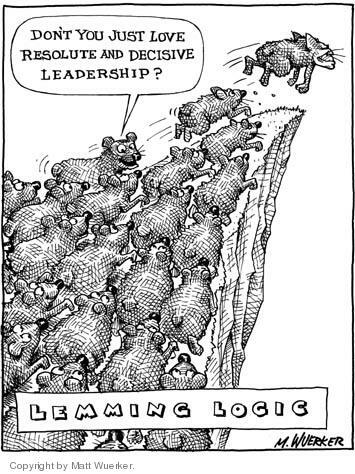 Britain should revert to central planning for electricity says the UK Independent Climate Change Committee and seeing central planning worked so well in the old USSR who would argue with these learned twits. Putting electricity generation in the hands of the government would avoid the necessity of such ridiculous things as balance sheets and profit and loss accounts and business planning. Just keep raising taxes and charges and she'll be right mate!! George Monbiot of the Guardian , an ardent supporter of the Warmist case claims that divine intervention is occurring on the skeptic's side to wreck Cancun! He fantasizes that God is a Republican or runs an intergalactic fuel conglomerate . This is probably mildly amusing to the largely atheist chatterati and shows how little Monbiot understands of where the oppostition to the Warmist scam comes from. A small blog costs ten dollars to setup and little to run and an oil empire is not required to oppose this nonsense. The truth is no longer the preserve of those controlling the main-stream media and instant dissemination of information at light-speed is what is bringing down the global warming edifice. Beautiful irony! The Guardian reports that Vicky Pope from the Met Office ( who incidentally predicted a mild winter) was prevented from flying to the Warmist talk-fest at Cancun because her plane was grounded. Canadian Free Press reports on claims made in the recently released book Slaying the Sky Dragon: Death of the Greenhouse Gas Theory that it is impossible using a mass spectrometer to determine whether CO2 in the atmosphere is man-made or natural. This is a central plank in the IPCC argument for man-made greenhouse gas warming . It is claimed that the IPCC isotope theory paper was "peer reviewed" by scientists in the global warming inner circle. Federal Government Solar panel rebates will be phased out next year in Australia which should put something of a a dampener on the whole ridiculous scheme. The level of scientific debate about climate has reached such a low ebb that whacko ideas suggesting geo-engineering such as space mirrors and/or iron filing seeding of the ocean have not been treated with the ridicule they deserve. These scientists have been reading too many Buck Rogers comics!